If you wonder who is that respectable, well dressed older man collecting sacks of returnable deposit bottles from restaurants on the midrahov, it is probably Yehoshua Sivan. Collecting bottles and claiming the money back is one of the ways he volunteers in Safed. In 1966, as a young couple, Yehoshua and his wife Hilary made aliyah from England, living at first in the center of the country. With his Doctorate in Chemistry, Yehoshua began work at the Weizmann Institute. He then transferred to Bar Ilan University where he trained teachers in science and chemistry. 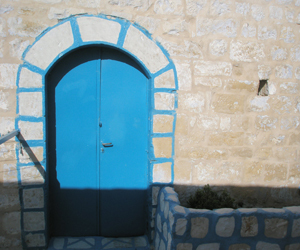 As their family grew, they decided that they preferred to live in the unique, friendly environment of Safed, and moved to the city in 1977. Yehoshua taught chemistry at the local high school until he retired a few years ago while Hilary, an English teacher, finished her career as the Principal of the Ulpanit in Safed. Coming from the volunteering culture of England, Yehoshua couldn't help but get involved with a good cause. When the beginning of the Ethiopian Aliyah started with Operation Moses in 1985, many of the new immigrants came to Safed and needed a lot of help with their absorption. Yehoshua offered to help one of his friends who was working with the project, and very soon he became completely involved. The Committee for Ethiopian Jews in Safed aims to help the complete integration of the Ethiopian community into Israeli society by giving financial and social support. Over the years the committee has built up a network of supporters in both North America and Israel who donate the $60,000 plus a year the committee needs for its work. Although the committee will give grants and loans to individuals suffering financial difficulties, it really prefers to help people to become self supporting. One of the main ways it does this is to enable students to continue their education by giving financial assistance. Even something simple like having a dictionary, money for texts books or supplementary courses can make all the difference to a student's success. Many of these students have gained B.A's and M.A's and are now working with the Ethiopian communities around the country themselves. Others have been helped to take trade courses like bus driving, hairdressing, or infant ‘carers' courses. The committee also helps supports student nurses at the Nursing School in Safed. Thanks to the Committee, the Ari Primary School was the first school in the country to have a Pina Neima or Cosy Corner. This is a special therapeutic room, developed by Pamela Mond, which helps students deal with fears, trauma and violence. It has been a model for others in the country and the committee also helped set one up in the Beirav Primary School. These facilities have been especially helpful for students deeply affected by the 2006 Lebanon War. Yehoshua doesn't just collect bottles to raise funds for the Ethiopian community in Safed, even though last year he managed to raise over 29,000 nis in this way. As the mainstay behind the Committee for Ethiopian Jews in Safed, he has been recognized for his outstanding work. In 1995 he was given the President's Award for Volunteering, "For work in absorbing Ethiopian new immigrants". In 1999 he and his wife Hilary were granted the Distinguished Citizen of Safed Award, and in 2002 the Absorption Award from the Jewish Agency "For your contribution and your work in absorbing new immigrants". At the end of 2011, on the 20th anniversary of Operation Solomon, the Mayor of Safed presented the Committee with a testimonial: "The Safed Municipality wishes to thank the Committee for Ethiopian Jews in Safed for their contribution and action towards the social and educational advancement, and successful absorption, of Ethiopian Jews in Safed in particular, and elsewhere in Israel in general."